UNITED NATIONS, March 30 -- Niger, the world's sixth largest producer of uranium and the venue of a recent coup d'etat led by a former UN peacekeeper, Salou Djibo, faces a severe drought. The UN's Central Emergency Relief Fund has put up $6 million, and on March 30 a press conference for the purpose of fundraising was held by the UN's Resident Coordinator for Niger, Khardiata Lo N'diaye. Did the seizure of power by force have any impact on the humanitarian situation, Inner City Press asked. Khardiata Lo N'diaye replied that the "de facto authorities have put the humanitarian issues at the top of their priorities." Video here, from Minute 3:48. Cursory research finds that "state-owned China National Petroleum Corporation... paid a $272 million signing bonus to the administration of Tandja, who had appointed his own son Ousmane as commercial attaché to the Nigerien Embassy in Hong Kong, a move NGOs say helped Chinese companies curry favor with the African ex-president." Inner City Press asked, with all due respect, if any contribution had been sought or received from China, and whether the ostensibly diplomatic UN mission of Robert Fowler, as a bridge between the government and the Tuareg, had been in touch with the UN Country Team, and was in any way still active. Video here, from Minute 12:08. Khardiata Lo N'diaye responded with a series of buzz words -- chronical vulnerability, development trends, sub regional Sahelian security issues. She did not answer if China has made any contribution, only emphasizing the the appeal for funds "is open." Where is former colonial power France? Only days before, the UN's Resident Coordinator for Guinea held a similar press conference, asking for funds, although in Guinea's case some funds would go for elections. The OCHA spokesman denied that was any connection between these two humanitarian press conferences about countries with recent coups. The UN is fumbling elections in Afghanistan, Iraq and Sudan. Could the answer be putting a humanitarian face on military rule? Watch this site. 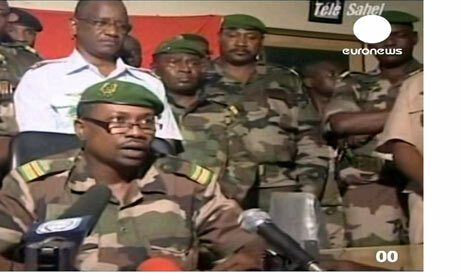 - Major Salou Djibo served in MONUC as a military observer from 06 August 2006 to 06 August 2007. At the time, he was a captain. - Concerning his alleged service in Côte d'Ivoire in ONUCI, we are unable to confirm this report. Any service of this individual in Côte d'Ivoire would have been as a member of the Niger contingent deployed there. Inner City Press asked the head of the Department of Peacekeeping Operations Alain Le Roy whether working and ostensibly receiving training with DPKO makes a soldier more or less likely to join or launch a coup. Video here. Le Roy and his fellow UN Under Secretary General John Holmes both laughed. Le Roy responded that the UN cannot answer for what peacekeepers do after their service, then countered with the example of former Nigerian President Obansanjo. Some found it a weak defense, given charges charges of irregularities in large infrastructure deals reached in Obansanjo's days in power. The two USG spoke in front of the UN Security Council, after a meeting about Haiti. Inner City Press was told by a Permanent Five member's political advisor that France was being "hesitant to raise Niger" in the Council, despite the fact that it forces the Council to consider attempts to overthrew Idriss Deby the strongman in Chad, another French ex colony. 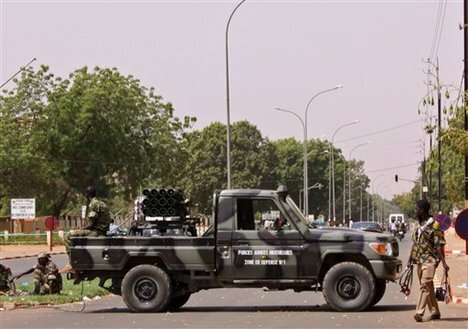 Inner City Press asked France's representative at the meeting, is anyone raising the Niger coup? "You are," he replied. On camera, the French representative said that neither Niger nor the delay of elections and increase of violence in Cote d'Ivoire had been discussed in the Council on Friday. Also unaddressed by France, the Council and Secretariat is the inclusion in Guinea's interim government of Major Claude Pivi, a military officer named in the UN's own report as likely being responsible for the massacre of civilians last September 28. Inner City Press asked UN Deputy Spokesperson Marie Okabe about it on February 17, and she referred to a previous Ban Ki-moon statement lauding the interim government. A French senior official on February 18 said he wasn't aware of it, and nothing was said on Friday either. "Maybe Monday," a fleeing diplomat said. And so it goes at the UN. Footnote: it is impossible to discuss Niger and the UN without recalling the UN's stealth envoy to the country, Canadian Robert Fowler, who was kidnapped while visiting a Canadian owned mine in the country. When he was released, he said someone in the UN in New York might have leaked his location and how to grab him. Then the UN tried to sweep the whole thing back under the rug. Now, a coup. Might the rug become unfurled?